Betsy DeVos, the new U.S. secretary of education, is a strong proponent of allowing public education dollars to go to private schools through vouchers, which enable parents to use public school money to enroll their children in private schools, including religious ones. Vouchers are advanced under the rubric of “school choice”—the theory that giving parents more choices regarding where to educate their children creates competition and thus improves low-performing schools. (Charter schools, though technically funded and regulated similarly to public schools, are another key private school component of the choice argument and another top policy priority for DeVos.) DeVos’s nomination and confirmation have heightened the debate over using privatization, versus other school improvement strategies, to enhance educational outcomes for students and their schools. This report seeks to inform that debate by summarizing the evidence base on vouchers. Studies of voucher programs in several U.S. cities, the states of Florida, Indiana, Louisiana, and in Chile and India, find limited improvements at best in student achievement and school district performance from even large-scale programs. In the few cases in which test scores increased, other factors, namely increased public accountability, not private school competition, seem to be more likely drivers. And high rates of attrition from private schools among voucher users in several studies raises concerns. The second largest and longest-standing U.S. voucher program, in Milwaukee, offers no solid evidence of student gains in either private or public schools. Extensive research on educational vouchers in the United States over the past 25 years shows that gains in student achievement are at best small. An educational voucher is a certificate of public funding of a certain amount that can be used by parents of students in any school of the parents’ choosing that accepts such vouchers, usually private. The regulations around vouchers vary from plan to plan. As originally conceived by Milton Friedman (1955), the purpose of vouchers is to break the “monopoly” of public schooling and extend families’ school choices for their children to include private education. Friedman, and voucher advocates more generally, argue that an education market that includes private schools competing on a financially level playing field with public schools, can deliver schooling more cheaply and satisfy consumer needs more effectively because private education is more efficient than public. Charter schools are more regulated than private voucher schools, since charters must be sanctioned by a state, county, or school district to receive public funding and are subject to public accountability. But charter schools are still private entities. Indeed, the argument for charter schools is based on the same philosophical foundation as vouchers, namely that consumer and cost-sensitive private (charter) schools, competing with public schools, would provide the best education for the most families (Chubb and Moe 1990). Voucher proponents argue that offering students the opportunity, through public financing, to attend private rather than public schools produces significant gains at two levels: that individual students gain from attending a more effective (private) school, and that students remaining in public schools gain because increasing private school competition for public school students pushes public schools to improve. Most studies test the first of these claims. In the late 1990s, voucher experiments were conducted in New York City, Washington, D.C., and Dayton, Ohio (Howell et al. 2000). The New York experiment, which involved low-income students entering private schools via vouchers in grades 2–5, was the only one that showed significant gains in test scores for any group of voucher students after three years, and gains appeared only for black students in a single cohort (Mayer et al. 2002). However, a closer examination showed that these gains had been overestimated and were not statistically significant because part of the baseline group of students had not been included in the sample of students analyzed (Krueger and Zhu 2004). The experiments in Dayton and Washington, D.C., had such large “losses” (students with vouchers who left voucher schools during the evaluation period) that no valid estimates of voucher effects could be made. A later voucher plan in Washington, D.C.—the Opportunity Scholarship Program—was funded directly by Congress and began in 2004. It, too, was targeted at low-income students. Students who volunteered to participate were randomly awarded vouchers to private schools, the majority of which were religious/Catholic schools. Those students offered or using vouchers in the two cohorts evaluated (students entering the program in 2004 and those entering in 2005) showed no significant reading or math gains over those who did not receive scholarships/vouchers, but high school graduation rates were significantly higher for those students in the sample who were in ninth grade or higher and therefore could have graduated in the period evaluated (Wolf et al. 2013). The most interesting policy aspect of the Opportunity Scholarship Program, however, was the relatively few placements (1,700) offered to students via the program by the 90 to 100 private schools operating in the district during this period (Washington, D.C., had about 70,000 public and charter students in 2004), and the high rate of school-switching among voucher recipients (Carnoy 2009). The most recent voucher programs evaluated are in Indiana and Louisiana. The Indiana program began in 2011 and offers vouchers to low- to middle-income students to attend private schools. Parents can supplement the publicly funded voucher with private funds. About 34,000 students took vouchers in 2016––2017. An evaluation of the Indiana program that compared time trends of voucher students’ test scores with the test score time trends of similar students in public schools showed significantly lower math and reading gains on the state test for voucher students (for a summary, see Dynarski, 2016). A statewide voucher program in Louisiana begun in 2008 and also aimed at low-income students now has almost 8,000 voucher recipients attending private schools. It, too, has been evaluated. Researchers used a quasi-experimental method and, again in this case, found that voucher students in private schools scored significantly lower in math and reading on the state test than the control group attending Louisiana’s public schools (Dynarski 2016). The experiment in New York, the second Washington, D.C., experiment, and the evaluation of Louisiana program provide the most reliable estimates of the impact that vouchers have on student reading and mathematics performance. Yet advocates for vouchers, at least for targeted vouchers in a U.S. setting, most often focus on Milwaukee, the city with the nation’s second largest (after Indiana) and longest running voucher program (it has been operating since the 1990s). About 28,000 students currently attend private schools using vouchers under the Milwaukee Parental Choice Program (MPCP), and about 75,000 students attend Milwaukee’s public schools (including charter schools); this constitutes one of the lowest shares (along with Washington, D.C., and New Orleans) of traditional public school enrollment in the country. Milwaukee has been a totally “choice” school district for almost 20 years—students can select among traditional public schools, public magnet schools, charter schools (if places are available), and, if eligible,2 private voucher schools (Carnoy et al. 2007). As a result, only one in four students attends his or her neighborhood school. If choice has a significant positive impact on student achievement, Milwaukee should be among the highest scoring urban school districts in the nation. Milwaukee’s private school students should be outscoring its public school students, and students in traditional public schools should have made large gains because of the intense competition from private and charter schools. However, none of these characterize Milwaukee’s school outcomes. The African American students who make up roughly two-thirds of Milwaukee’s student body are the main recipients of vouchers. Their academic performance is thus important in assessing the overall impact of choice in the district. Figures A and B compare the National Assessment of Educational Process (NAEP) scores of black students in eighth-grade math and reading in 13 urban U.S. school districts. Black students in Milwaukee have lower eighth-grade math scores than students in every city but Detroit—notably, another urban district with a high level of school choice. In reading, Milwaukee’s black eighth-graders do even more poorly. They score lower than black eighth-graders in all other 12 city school districts. 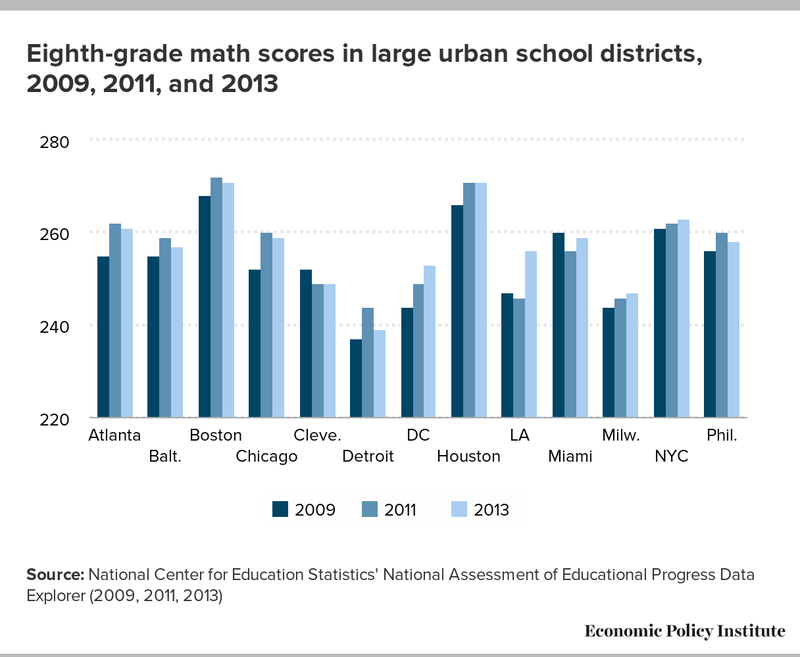 Although not represented in a figure, fourth-grade NAEP scores for the 13 cities show the same pattern. It is possible that Milwaukee students had initially even lower NAEP scores than students in other urban districts and made much larger gains than other districts’ students since the early 2000s, after the current voucher plan was implemented in 1998. However, we cannot test this proposition using NAEP data because Milwaukee only participated as a district in NAEP in 2009, 2011, and 2013. Students in Milwaukee’s public schools did make large gains on the Wisconsin state test in fourth- and eighth-grade mathematics from 2007 to 2008, but have not improved since, and they did not make significant gains in reading between 2007 and 2011. So given that the only substantial test score gains were in math and only for one year, the argument that vouchers have turned Milwaukee into a high achieving school district is weak. More systematic studies of student performance gains in private schools and the effects of competition on public school students’ performance likewise show that if vouchers have improved student learning in Milwaukee’s public schools, the effects are small. In 2006, the state of Wisconsin commissioned a group of academics to evaluate whether voucher students attending private schools (MPCP students) made larger gains in reading and mathematics over a four-year period than similar students in Milwaukee’s traditional public schools (MPS). The researchers applied Wisconsin state tests to a sample of private schools that had agreed to participate and compared the results annually with a matched set of public school students. The results show that there were no significant differences in the gains of MPCP and MPS students in either subject in the first three years evaluated (Witte et al. 2012). In the fourth year, 2010–2011, the Wisconsin legislature required all private schools accepting voucher students to participate in the Wisconsin state test. In that fourth year, the gains in math and reading scores were greater for MPCP students than for matched public school students (Witte et al. 2012, Figure 3). The researchers cautioned, however, that much, if not all, of these gains resulted from the accountability measure imposed by the legislature in that year rather than MPCP students’ private school attendance. The authors suggested that making Wisconsin test results for private schools available to the public for the first time pushed these schools to increase instruction of curricular elements that might appear on the test, which helped increase scores. Indeed, this same influence of accountability measures is observed in evaluations of a large state-level voucher program in Florida. Starting in 1999, the Florida A+ program rated public schools from A to F based on annual test scores and test score gains. Students in schools receiving an F rating two out of four years—“chronically failing schools”—were eligible to receive vouchers, called “Opportunity Scholarships” to attend private schools. In practice, very few vouchers were awarded because schools designated as F schools in one year tended to make significant improvement in the next year. One study (Greene 2001) attributed the significantly higher gains made by F-rated schools compared with D-rated schools to “voucher threat”—in other words, the threat of losing students to competing private schools. However, a second study showed that a similar, directly preceding accountability plan in Florida that designated schools as “critically low performing” but did not include a voucher threat, produced improvements among such low-rated schools that were just as great as the improvements in the F-rated schools under the Florida A+ plan (Figlio and Rouse 2006). The second study concludes that the stigma of being labeled a low-performing or failing school is the likely reason for greater improvement. Thus, increased public accountability, not private school competition, is a more effective mechanism for producing test score gains in low-performing schools. Other studies have estimated the impact of private school competition on student achievement in Milwaukee’s traditional public schools. Hoxby (2003) and Chakrabarti (2005) show that in the two years following the Wisconsin Supreme Court decision of 1998 allowing publicly funded vouchers to be used in religious schools, test scores in Milwaukee public schools as compared with “similar” Wisconsin schools outside Milwaukee increased significantly. However, in subsequent research I compared the individual test score gains between the 2001–2002 school year and the 2002–2003 school year of students in public schools within Milwaukee with many nearby private schools accepting voucher students and students in public schools with few nearby competing private schools offering voucher places. This study showed no significant effects of greater competition from private voucher schools (Carnoy et al. 2007). Moreover, test scores in Milwaukee public schools fell in subsequent years. These contradictory results suggest that “the observed improvement in public school test scores associated with the implementation of a greatly expanded voucher plan in 1998-99 and 1999-2000 was probably a response to the [initial] threat of increased competition” (Carnoy et al. 2007, 3). Participation in the MPCP increased by 6,000 students in 1998–2000, and by an additional 5,000 students in the following four years. Yet, further improvements did not occur despite increases in voucher uptake (implying increased competition from private schools) in subsequent years. In other words, these studies suggest that the threat of vouchers provides a one-time boost to achievement of students in public schools, but this boost is not necessarily sustained. One possible reason that public school test scores did not continue to rise is that the Milwaukee Public School District (MPSD) did not take aggressive action against low-performing public schools or those public schools losing enrollment. That is, the MPSD may not have conveyed a sufficiently strong signal to public schools that poor school management would result in reorganization or closure. But that is not the case. The MPSD did send a sufficiently strong signal that poor management would have repercussions because it has been closing and consolidating public schools since the early 2000s. If researchers examining other programs in other locations were finding that private school competition leads to a sustained increase in public school student performance, the Milwaukee results would be an anomaly and thus have to be explained by specific conditions in Milwaukee. But researchers are not finding that private school competition elsewhere has led to a large sustained increase in public school student performance. Studies in Chile, which implemented a national voucher program in 1981, show no impact of competition on public school student performance (Hsieh and Urquiola 2006). And a general review of studies on the effect of competition on educational outcomes indicates that competition has a positive impact but the impact is small (Belfield and Levin 2002). Most recently, a large-scale experiment in India compared students’ public school performance in rural communities where vouchers to attend private schools had been awarded with public school student performance in rural communities where vouchers had not been awarded (Muralidharan and Sundararaman 2015). The estimates showed no significant difference in student performance in the two types of communities. While there are certainly reasons to be skeptical that countries so different from the United States provide the strongest evidence that private school competition does not lead to large sustained increases in public school student performance, the lack of other domestic studies renders stronger comparisons impossible. Why does school privatization at public expense continue to be pushed at the state and federal level when the empirical evidence points so glaringly in one direction—that neither the move from public to private school nor increased competition from private schools significantly improves student achievement? For example, proponents of “school choice” keep insisting that providing increased access to privately managed and owned schools improves academic achievement, but studies of voucher plans suggest something else: that when test score gains do occur in such programs they are likely the result of increases or perceived increases in school accountability. Is privatization being pushed as an education policy because studies show modestly higher rates of graduation and four-year college attendance for attending private school with students? This is a doubtful justification for such a radical departure from direct public school improvement policies for several reasons. First, we don’t know why these schools are increasing graduation rates. The same researchers who suggest that the introduction of accountability measures, rather than vouchers, drove test score bumps also estimated high school graduation and college attendance differences for the eighth- and ninth-graders in the Milwaukee sample. They found that MPCP students were somewhat more likely to graduate on time (but overall graduation rates in voucher schools were not found to be significantly higher once fifth-year graduation is included) and to attend four-year college (Cowen et al. 2013). The differences are significant but small, and they are consistent with higher graduation rates found in the 2004 Washington, D.C., voucher program (Wolf et al. 2013). Higher on-time graduation rates of private high school students may be the result of many factors, including private high schools’ willingness to shed less motivated students, and the greater focus of some private schools on helping students enter four-year colleges. The Milwaukee researchers were not able to identify the reasons for the differences, but for both research and policy purposes it is important to understand whether these schools are increasing graduation rates because they are shedding lower-performing students or because they are engaged in positive practices. Second, high school graduation rates have risen sharply in public education in the last 10 years (Murnane 2013). The increases reported by Murnane are much larger than the small effect estimated on graduation rates from attending a voucher school. Third, it would be relatively easy to increase both graduation and four-year college attendance by investing modestly more in the number of college counselors in public high schools and in training them better. Expanding public subsidies to private schools has enough other potential downsides—such as increased school segregation (Bifulco and Ladd 2006, in North Carolina; Hsieh and Urquiola 2006, in Chile), and losing the common, secular educational experience provided by public schools—that moving forward with this radical reform to achieve slightly increasing high school graduation rates seems rather unreasonable. Another argument often given for vouchers and choice programs is that vouchers cost less per student than traditional public education. (This argument also applies to charter schools.) However, this cost argument is flawed. Voucher programs and most charter schools can run at a lower cost for several reasons that would not be sustainable were voucher programs to replace much of public education. First, private voucher schools have several ways to avoid higher cost students not available to public schools. Most important among these is that even if required to admit students by lottery, voucher schools can later ease out students that are not performing well or are not sufficiently conforming to the school’s mission (Benveniste, Carnoy, and Rothstein 2003). Second, some teachers and staff at religious private schools are subsidized by religious organizations. Third, many voucher (and charter) schools “free ride” the bigger teacher labor market by hiring much younger teachers with no promise of permanent employment. The “free rider” aspect of teacher costs in private schools, whether voucher or charter, means that the supply of young people entering the teaching profession is maintained by the salary structure and tenure system in public education. Without this structure, many fewer individuals would take the training needed to become certified to enter teaching. Since teaching salaries are low compared with other professions, the prospect of tenure and a decent pension provides the option of security as compensation for low pay. This pool of young, trained teachers is available to voucher and charter schools, generally at even lower pay than in the public sector and without promise of tenure or a pension, but with the possibility of training and experience. Thus, the public education employment and salary system “subsidizes” lower teacher costs in private and charter schools.3 In other words, for private schools to have lower costs, it is necessary to maintain a largely public system that pays teachers reasonable (but still low) salaries and provides for a teacher promotion ladder and job security. If the lower cost argument does not compensate for the lack of evidence that vouchers significantly improve student achievement (test scores) and they, at best, have a modest impact on educational attainment (graduation rates), what is left to support privatization? The answer is: ideology. According to Henry Levin, William H. Kilpatrick Professor of Economics and Education at Teachers College of Columbia University, the debate about vouchers is based on ideological differences between those who attach greater importance to individual choice, and therefore education markets, and those who place greater importance on equity, commonality, and public accountability, and therefore support public education (Levin 2002). The push for vouchers and charters could be seen as distracting from implementing programs that can, in fact, improve student learning. There are many other policy changes that are likely to have much higher payoffs than privatization. Investing more in excellent teacher pre-service training (Boyd et al. 2009), in early childhood education (Heckman and Masterov 2007), in after-school and summer programs, in improved student health and nutrition programs in and out of schools, and in implementing high standards in math, reading, and science curricula (Schmidt et al. 2001), all yield higher returns than the very small, if any, gains that have been estimated for voucher and charter students. The fact is that some U.S. states such as Massachusetts, Minnesota, North Carolina, and Texas followed through on high yield reforms in the 1980s and 1990s, and public school students reaped their benefits (Carnoy, Garcia, and Khavenson 2015). Students in Massachusetts score as high as students in Finland on the Programme for International Student Assessment (PISA) mathematics test and higher on the PISA reading test. PISA is a study by the Organization for Economic Cooperation and Development in member and nonmember nations and assesses 15-year-olds’ scholastic performance on mathematics, science, and reading. Betsy DeVos, Donald Trump’s new secretary of education, has been a devout advocate for private and religious education. She has played a major role in pushing for charter expansion in her home state of Michigan. Charter expansion has not helped Detroit or Michigan improve their stagnant, low-performing education systems (Carnoy, Garcia, and Khavenson 2015; Harris 2016). The federal government has relatively little to say about education policy in our distinctly federal system. States are in charge. Nevertheless, DeVos, with the backing of a conservative Congress and the president, could provide funding for voucher and charter expansion in the states rather than funding programs that are more likely to improve learning. The tone set by the secretary of education, if it demeans public schooling and teachers’ unions, could put downward pressure on teachers’ salaries and benefits, and therefore reduce the incentive for young people to go into teaching as a profession, increasing the shortage of teachers. DeVos could also divert many states from implementing public school reforms that would improve student learning. On the other hand, the appointment of DeVos could provide increased motivation for states that want to improve public education in a meaningful way, investing in longer range programs that work. By relying on the evidence, such as that presented in this report, those states could construct the systems that prove, on a large scale, that the best “choice” education system is the one that improves every family and every neighborhood public school. Martin Carnoy is Vida Jacks Professor of Education and Economics at Stanford University and a research associate of the Economic Policy Institute. He has written more than 40 books and 150 articles on political economy, educational issues, and labor economics. He holds an electrical engineering degree from Caltech and a Ph.D. in economics from the University of Chicago. Much of his work is comparative and international. His recent books include Sustaining the New Economy: Work, Family and Community in the Information Age, The Charter School Dust-Up (coauthored with Richard Rothstein), Vouchers and Public School Performance, Cuba’s Academic Advantage, and The Low Achievement Trap. 1. Since all of the families in the pool declared their desire to send their children to a private school by volunteering for the voucher, in principle, random assignment of vouchers to students in this pool would be expected to leave voucher status uncorrelated with families’ motivation to improve their children’s educational prospects. Parents’ motivation is a major source of bias in estimating school effects on student academic performance. 2. Originally, voucher eligibility in Milwaukee was determined by family income being below 175 percent of the federal poverty line. This requirement has edged upward, so that today, it is 300 percent of the poverty line, and 220 percent to be eligible for a tuition waiver in those private high schools permitted to charge additional fees for voucher recipients. 3. Advocates of teaching as a “temporary” profession, such as Teach for All’s Wendy Kopp, argue that the real price of teachers should be even lower than it is, because teaching, like carpentry, but unlike medicine, the law, or professional soccer, is something that is largely innate and the rest can be learned in eight weeks of training and on the job. Although some studies show that Teach for All teachers fare about as well as young trained teachers (Boyd et al. 2009), more generally, teaching experience has a positive impact on student achievement, and this effect continues to increase well beyond just the first five years (Ladd and Sorensen 2016). Belfield, Clive, and Henry M. Levin. 2002. The Effects of Competition on Educational Outcomes: A Review of U.S. Evidence. New York, N.Y.: Teachers College, Columbia University, National Center for the Study of Privatization in Education. Benveniste, L., M. Carnoy, and R. Rothstein. 2003. All Else Equal. New York: Routledge. Bifulco, R., and H. F. Ladd. 2006. “The Impacts of Charter Schools on Student Achievement: Evidence from North Carolina.” Education Finance and Policy, vol. 1, no. 1, 50–90. Boyd, D., P. Grossman, H. Lankford, S. Loeb, and J. Wyckoff. 2009. “Teacher Preparation and Student Achievement.” Educational Evaluation and Policy Analysis, vol. 31, no. 5, 416–440. Carnoy, M., F. Adamson, A. Chudgar, T. Luschei, and J. Witte. 2007. Vouchers and Public School Performance: A Case Study of the Milwaukee Parental School Choice Program. Washington, D.C.: Economic Policy Institute. Carnoy, M., E. Garcia, and T. Khavenson. 2015. Bringing It Back Home. Washington, D.C.: Economic Policy Institute. Chakrabarti, Rajashri. 2005. Can Increasing Private School Participation and Monetary Loss in a Voucher Program Affect Public School Performance? Evidence from Milwaukee. Cambridge, Mass. : Harvard University, Kennedy School. Chubb, J. E., and T. M. Moe. 1990. Politics, Markets, and America’s Schools. Washington, D.C.: Brookings Institution Press. Cowen, J., D. Fleming, J. Witte, P. Wolf, and B. Kisida. 2013. “School Vouchers and Student Attainment: Evidence from a State-Mandated Study of Milwaukee’s Parental Choice Program.” Policy Studies Journal, vol. 41, no. 1, 147–168. Figlio, D., and C. Rouse. 2006. “Do Accountability and Voucher Threats Improve Low-Performing Schools?” Journal of Public Economics, vol. 90, no.1–2, 239–255. Friedman, M. 1955. “The Role of Government in Education.” In Economics and the Public Interest, Robert A. Solo ed. New Brunswick, N.J.: Rutgers University Press. Greene, J. 2001. An Evaluation of the Florida A-Plus Accountability and School Choice Program. New York, NY: Manhattan Institute, Center for Civic Innovation. Harris, D. 2016. “Betsy DeVos and the Wrong Way to Fix Schools.” New York Times, Opinion pages, November 25. Heckman, J. J., and D. V. Masterov. 2007. “The Productivity Argument for Investing in Young Children.” Applied Economic Perspectives and Policy, vol. 29, no. 3, 446–493. Howell, W. G., P. J. Wolf, P. Peterson, and D. Campbell. 2000. “Test-Score Effects of School Vouchers in Dayton, Ohio, New York City, and Washington, D.C.: Evidence from Randomized Field Trials.” Paper prepared for the annual meetings of the American Political Science Association, Washington, D. C., September. Hoxby, Caroline M. 2003. “School Choice and School Competition: Evidence from the United States,” Swedish Economic Policy Review, vol. 10, 11–67. Hsieh, Chang-Tai, and Miguel Urquiola. 2006. “The Effects of Generalized School Choice on Achievement and Stratification: Evidence from Chile’s School Voucher Program.” Journal of Public Economics, vol. 90, 1477–1503. Krueger, A., and P. Zhu. 2004. “Another Look at the New York City Voucher Experiment.” American Behavioral Scientist, vol. 47, no. 5, 658–698. Ladd, H., and L. Sorensen. 2016. “Returns to Teacher Experience: Student Achievement and Motivation in Middle School.” Education Finance and Policy, posted online April. Levin, H. M. 2002. “A Comprehensive Framework for Evaluating Educational Vouchers.” Educational Evaluation and Policy Analysis, vol. 24, no. 3, 159–174. Levin, H., and C. Driver. 1997. “Cost of an Educational Voucher System.” Education Economics, vol. 5, no. 3, 265–283. Mayer, D. P., P. E. Peterson, D. E. Myers, C. Tuttle, W. G. Howell. 2002. School Choice in New York City after Three Years: An Evaluation of the School Choice Scholarships Program. Final Report. Cambridge, Mass: Harvard University, Kennedy School. McEwan, P., and M. Carnoy. 2000. “The Effectiveness and Efficiency of Private Schools in Chile’s Voucher System.” Educational Evaluation and Policy Analysis, vol. 22, no. 3, 213–239. Muralidharan, K., and V. Sundararaman. 2015. “The Aggregate Effect of School Choice: Evidence from a Two-Stage Experiment in India. Quarterly Journal of Economics, vol. 130, no. 3, 1011-1066. Murnane, R. 2013. “U.S. High School Graduation Rates: Patterns and Explanations.” Journal of Economic Literature, vol. 51, no. 2, 370–422. National Center for Education Statistics, National Assessment of Educational Progress,. 2009, 2011, and 2013. Mathematics and Reading Assessments. Main NAEP Data Explorer. Schmidt, W. H., C. McKnight, R. Houang, H. Wang, D. Wiley, L. Cogan, R. Wolfe. 2001. Why Schools Matter: A Cross-National Comparison of Curriculum and Learning. San Francisco, Calif.: Jossey-Bass. Witte, J., D. Carlson, J. Cowen, D. Fleming, and P. Wolf. 2012. MPCP Longitudinal Educational Growth Study: Fifth Year Report. Fayettevill, Ark. University of Arkansas, School Choice Demonstration Project. Wolf, P., B. Kisida, B. Gutmann, M. Puma, N. Eissa, and L. Rizzo. 2013. “School Vouchers and Student Outcomes: Experimental Evidence from Washington, DC.” Journal of Policy Analysis and Management, vol. 32, no. 2, 246–270.